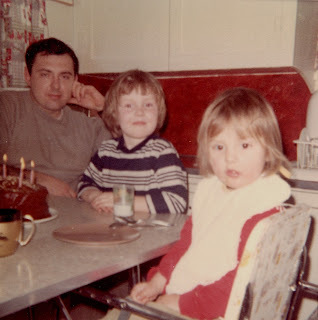 Here's Gary (Dad, Joanie and Janis) on Dad's birthday. Dad's birthday is January 30th and he'd be 70 years old! Greta's birthday is coming up and Auntie Joanie's birthday is only 2 weeks away. Janis and I talked today and she is making a 5 level R2D2 cake for Grayson's Cub Scout Group's Crazy Cake day tomorrow. Hope it turned out okay! This a great picture - Janis looks a bit messy though. I wonder how Janis and Grayson's R2D2 cake turned out - any cake that is 5 layers and has wooden dowels running through it just to maintain structural integrity would garner a reaction just like little Janis has in this photo - "say what?" Update: Janis said the R2D2 cake turned out very well. There were the 5 layers and also a split sheet cake for the legs on each side. Whew! Lots of work - will get a picture asap.